BST&G Fire Chief Jeff Wilson prepares to speak at his retirement in the district’s station at 350 W. Cherry St. in Sunbury on Jan. 31. On the table to the right of Wilson is a ceremonial fire ax that was presented to him. 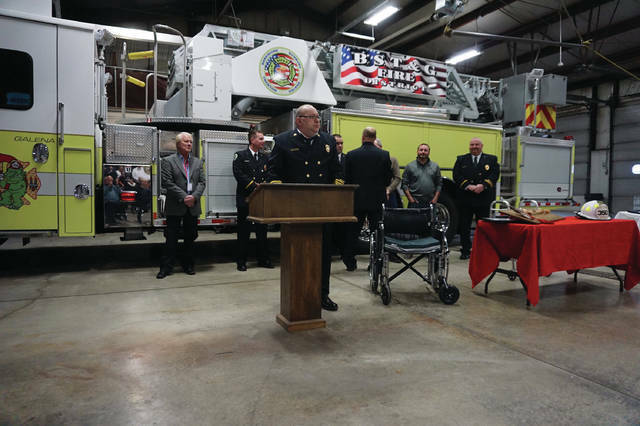 Surrounded by friends, family and colleagues, Berkshire Sunbury Trenton and Galena Fire District Fire Chief Jeff Wilson retired after 30 years of public service on Jan. 31. The apparatus bay of the BST&G’s station at 350 W. Cherry St. in Sunbury featured cakes and commendations, a ceremonial fire ax and a slide show commemorating Wilson’s career. More than 100 people attended, including many of Wilson’s counterparts from Franklin and Delaware counties. A dispatcher announced Wilson’s retirement over the district’s radio intercom. Many was the time that Wilson was called away from his family — wife, Marla, son, Danny and daughter, Krysti — to respond to an emergency, Kline said. “It takes a lot of dedication, a special someone, and Jeff was that someone for this department,” Kline added. Wilson even took the same training classes he insisted his officers take. Kline told The Sunbury News the district’s board would meet and make a decision about a replacement for Wilson in the coming days. “We’re not finished growing,” he said. BST&G has 11 full-time and 13 to 14 part-time employees, Kline said. Wilson moved to the area in 1987 after being after being a fire prevention officer in Orange Township and in code enforcement at the State Fire Marshal’s Office. Two months later he joined the district, starting as a volunteer. He was promoted to a lieutenant around 1998, deputy chief in 2003, assistant chief in 2008, became the first full-time employee in 2011 and promoted to fire chief later that year. Wilson started the Delaware Area Response Team and the Delaware County HazMat team; sat on the county’s 911 board and Delaware County Fire Chiefs’ Association; and introduced House Bill 277, which eliminated double taxation on 911 services in the county. Outside of the department, Wilson has volunteered with the Boy Scouts and Sunbury United Methodist Church. Last year, he received the Chamber’s “Service above Self” award. Reading proclamations to celebrate Wilson’s selfless work were Delaware County Commissioner Gary Merrell, Delaware Fire Chief John Donahue, Sunbury Village councilman Tim Ghose and Sunbury/Big Walnut Area Chamber of Commerce board president Cindy Erndt. “You’ve saved so many lives,” said County Commissioner Barb Lewis, when asked to comment on Wilson. Among those lives was a dog that fell through the ice and was rescued by unit 2 crew from BST&G and Delaware County EMS on Jan. 6. Recently, Wilson has had two brain tumors successfully removed. He got up from his wheelchair to speak at his retirement, but was overcome with emotion. Marla read aloud the speech he had prepared. Wilson will still visit the station from time to time, he said. https://www.delgazette.com/wp-content/uploads/sites/40/2018/02/web1_DSC02053.jpgBST&G Fire Chief Jeff Wilson prepares to speak at his retirement in the district’s station at 350 W. Cherry St. in Sunbury on Jan. 31. On the table to the right of Wilson is a ceremonial fire ax that was presented to him.